Once sought after by kings and valued as highly as gold, today, frankincense has regained popularity with aromatherapists, natural healers, and spiritualists the world over as modern science has isolated certain active compounds in frankincense that have anti-arthritic properties. In use for thousands of years, Frankincense has perhaps the greatest association with spiritualism than any other plant, herb, or oil on earth; it is even mentioned in the Bible as one of the gifts brought to the baby Jesus by the Three Wise Men. Frankincense has been used for over 5,000 years, burning in temples throughout India, Egypt, and China, and even today it is the incense of choice of the Catholic Church. Many of the Jewish faith use frankincense as one of the four main ingredients, the four sweet scents, in their ceremonial incense, forming an important part of their Sabbath offerings. 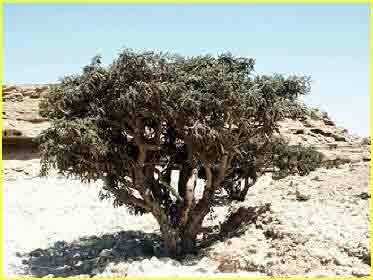 Frankincense is frequently mentioned in the Pentateuch and was presented along with shew-bread on the Sabbath. The earliest recorded use of frankincense dates to an inscription in the 15th century BC tomb of an Egyptian Queen named Hathsepsut. The ancient Egyptians are known to have used frankincense as an incense, and they ground the charred resin into Kohl, a powder used to make the distinctive black eyeliner seen on many figures in Egyptian art. The ancient Egyptians seemed to know of the health properties of frankincense, it was an ingredient in a popular rejuvenating facial mask. The earliest archeological evidence for the burning of incense comes from finds of spoon-shaped burners with long handles. Although no chemical evidence of the exact resin used has been found, researchers have managed to chemically characterize frankincense from a site at Quasr Ibrim. The Egyptians were also known to have warmed their rooms in cold weather with a brazier burning frankincense, benzoin, and aloe. In ancient Babylon, the great Temple of Baal is known to have used 2.5 tons of frankincense per year according to ancient documents and the writings of Herodotus. In those days, about 2,000 years ago, there was a tremendous frankincense trade and many of today's middle-eastern cities sprang up along those old trade routes. Frankincense grew so valuable as to rival gold and inspired Alexander the Great to plot to control the movement of frankincense just before his death. Herodotus also tells of the women of Scythia making frankincense into a perfume for the hands. In China, frankincense was used for the treatment of leprosy and Pliny touts its qualities as an antidote to hemlock though it was not used by the Greeks in Trojan times. The Romans, according to Virgil in the Ecologues, used frankincense, what was then called mascula thura, for more than just religious ceremonies, it was also used on state occasions and in domestic life. The term 'Frankincense' is derived from the Medieval French word franc, meaning 'pure' or 'free', and from the Latin term incensium, meaning 'to smoke'. Frankincense is derived from a rather remarkable tree (which more closely resembles a large bush-up to 15" in height), Boswellia Thurifera, more commonly known as Olibanum, which needs little if any soil (and seems quite at home in harsh conditions) and is found in Northern Africa and parts of the Middle East such as Yemen. The knurled branches are topped with an abundance of twisted, slender leaves and small white flowers. Frankincense is derived from the sap of the tree and has a certain lore surrounding it from ancient times. The younger trees furnish the more valuable gum while the older trees yield a clear, glutinous fluid resembling varnish. To obtain the sap the tree bark is pierced with a special knife called a Mingaf. The knife makes a deep, longitudinal incision in the trunk of the tree and just below it a 5" strip of bark is peeled off. From the hole a milky-white oleoresin appears and the tree suffers no real harm. When the sap is hardened by exposure to the air, the incision is deepened and in about three months the resin forms tiny droplets known as 'tears' or 'pearls', which harden into the yellowish/orange-brown gum known as Frankincense. The tears are scarped off into baskets and the more inferior sap that has run down the tree is collected separately. The essential oil is the either steam or CO2 distilled from the resin. Once sought after by kings and valued as highly as gold, today, frankincense has regained popularity with aromatherapists, natural healers, and spiritualists the world over as modern science has isolated certain active compounds in frankincense that have anti-arthritic properties. These same compounds were used in Ayurvedic medicine, when frankincense was known as salaiguggul, and was used for centuries to treat arthritis. Called boswellic acids, these compounds inhibit the inflammatory process, improve blood supply, and prevent cartilage reduction. Today, frankincense is usually found in incense and pastilles, and in some instances in plasters and may be substituted for balsam at times. It is also found in the perfume industry, but its true worth is in domestic usage. The inhalation of steam rising from boiling water laden with the warm, woody, sweet oil is said to relieve bronchitis, laryngitis, cough, bronchitis, asthma, catarrh, and throat inflammation. The purifying and relaxing character of frankincense is said to strengthen willpower, self-confidence, and determination. 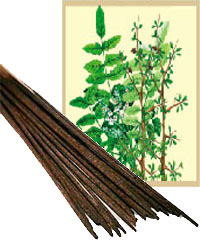 The oil is also used for treatment of wrinkles, wounds, dry skin, rheumatism, cystitis, and leukorrea. Frankincense is also regard as an anti-depressant and can assist with relaxation, revitalization, exhaustion, and nervous tension. The essential oil contains sesquiterpenes, which stimulate the limbic system, the hypothalamus, and the pineal and pituitary glands, and is even being studied for its ability to increase human growth hormone production. Besides being burned as an incense or warmed in a candle lamp, you can also directly apply the essential oil to the temples and it is often blended with sandalwood, myrrh, and cedar for such applications. The small chunks of resin harvested from the trees can be lit by themselves in a dish and allowed to smolder or you can burn prepared incense sticks and cones.